World top companies by revenues - with visuals. Where to invest? With so many changes on the horizon 2017 could be a volatile time for markets. With that in mind, it’s always good to know the solid numbers companies hold. As most top companies try to publish the most flattering numbers they can, there is usually a more complex story behind those numbers. With that in mind, we’ve decided to share with you 2 very interesting infographics. Both of the following visuals present the world’s top companies by revenue, based on data from Forbes. But as looking at revenue numbers doesn’t give a full picture on how these companies compare – there is another story to tell: profit. 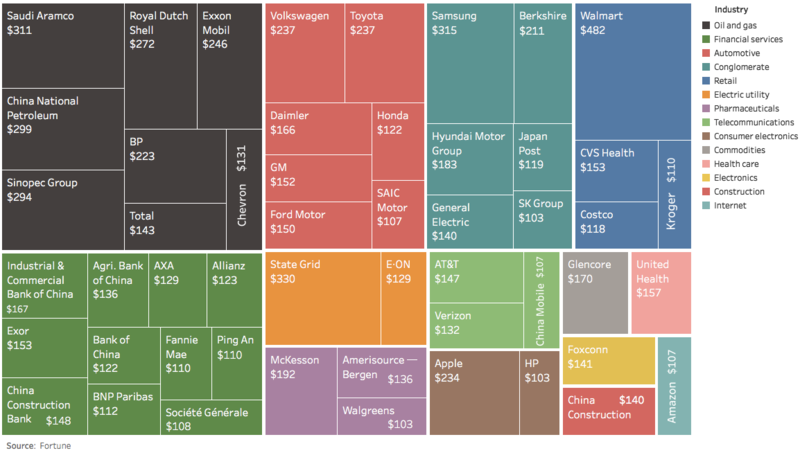 Therefore, the second visual shows the top 100 biggest companies by market value, and uses circles to represent both the revenue and profit for each company. This next very cool bubble chart represents The Top 100 Companies: Revenue vs. Profit, based on data from Forbes. Among it’s highly interesting insights, it shows Apple is a genuine money maker. The only companies that can compare with Apple were Chinese banks like ICBC or China Construction Bank. It’s that Apple is unparalleled in its ability to make money. In fact, Apple’s 2016 profit of $45 billion is far bigger than any other company, including Berkshire Hathaway ($24 billion), JPMorgan Chase ($24 billion), Wells Fargo ($22 billion), Alphabet ($19 billion), Samsung ($19 billion), Toyota ($17 billion), Johnson & Johnson ($16 billion), or Walmart ($14 billion). The only companies that can compare with Apple were Chinese banks like ICBC, Agricultural Bank of China, or China Construction Bank, but in many ways these state-owned enterprises are on an entirely different playing field, anyways. We at Tradeo recommend that traders set their investing goals and the style of investing before they consider buying any stock. Then they can identify stocks that meet their specific criteria, and finally identify the specific Demand Zone in which to buy. Even the best stock isn’t a good investment if the timing isn’t right or it isn’t appropriate for your needs. It is important to remember, that the most profitable stocks are not always to best to invest in. Warren Buffett and, and before him, Benjamin Graham were experts at this strategy. They’d look for the best companies to invest in with strong management and a product you could understand combined with value. Meaning they were looking for a stock price that was significantly below what it should be.